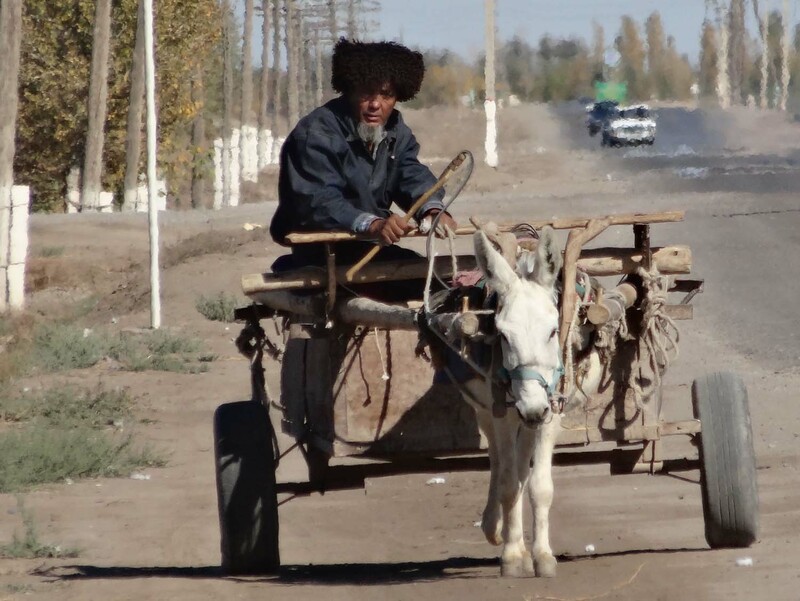 Sadly we could only spent 5 days in Turkmenistan as we had a transit visa for that amount of time. This visa also states where exactly you must enter the country and from which border crossing you need to leave. 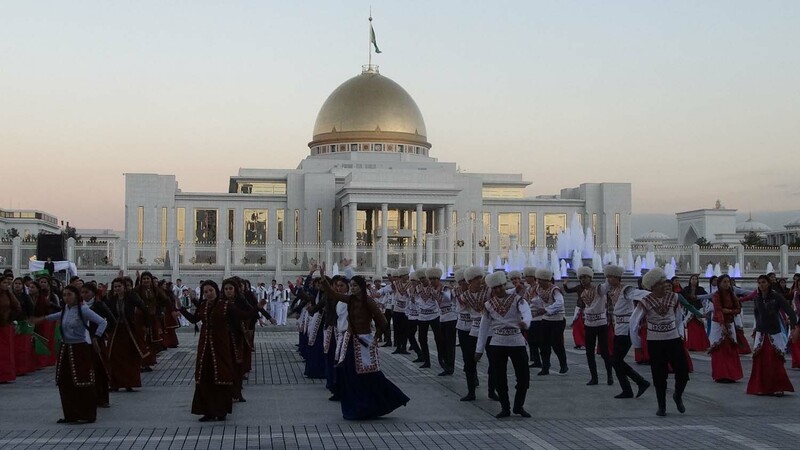 We were allowed to enter at Konye-Urgench and leave near Ashgabat, the capital. If you look at the map you’ll see we basically drove a straight line south through the Karakum Desert, the hottest desert of Central Asia. Konye-Urgench is yet another UNESCO world heritage site, and was the centre of the Islamic world in the 12th century. However, after Ghengis Khan laid siege to the city for 6 months, little remained. 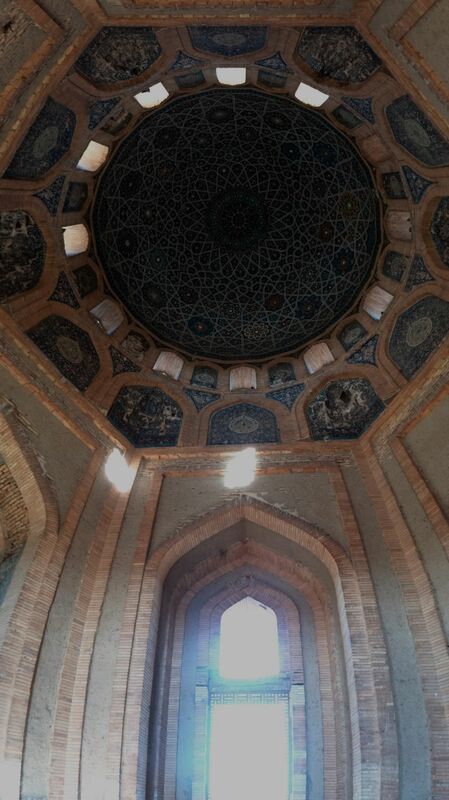 The mausoleums and minarets which do remain, are very impressive. 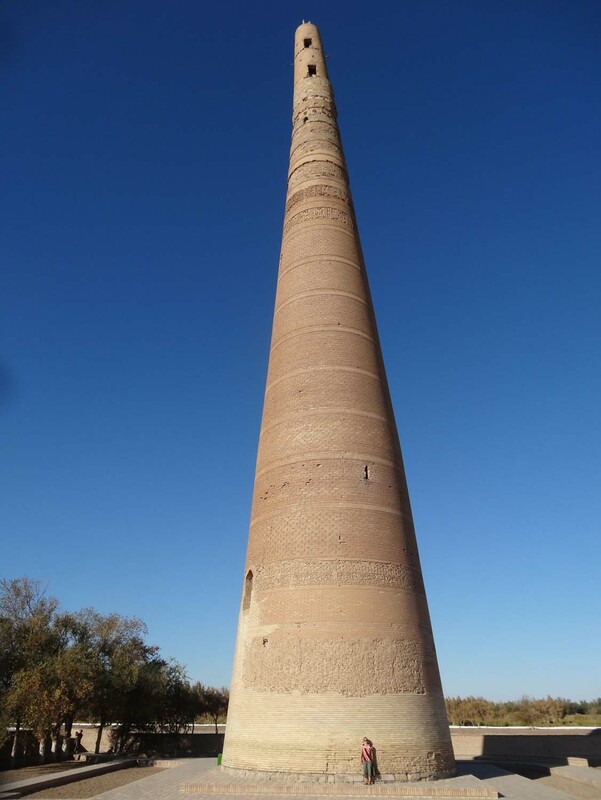 The 59m high minaret, all that remains of the main mosque, was spared by Gengis Khan, although now it is precariously leaning over, especially the top section. Close by was the Turabeg Kahnym mausoleum (which has a heating system so it might not have been ‘just a tomb’) is a spectacular ceiling. It shows 365 symbols, one for each day of the year, has 12 decorative windows to represent the months and 4 massive windows, one for each season and remains in original unrestored condition. Beautiful. the Central Asian Leaning Tower of Pisa? 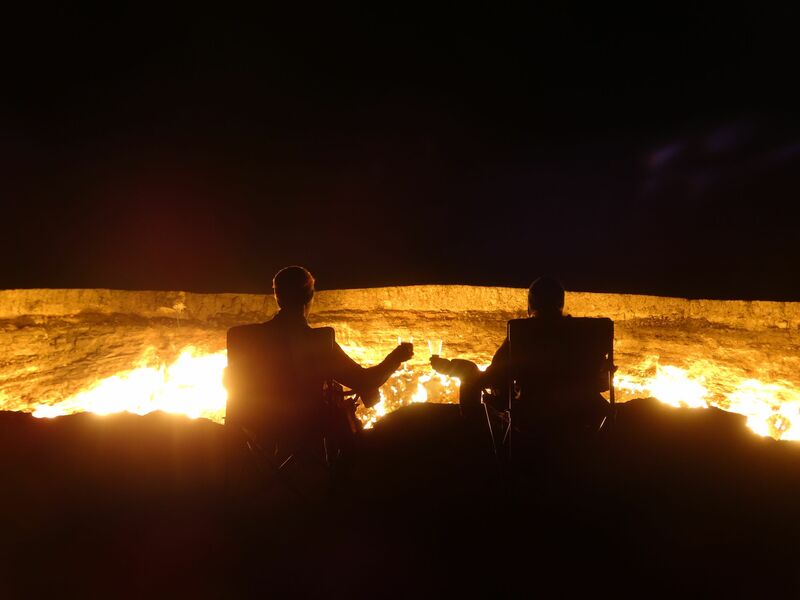 Our next stop was a bit of a strange one, some even compare it with ‘a Gate to Hell’, and we were told that it was best experienced at night. 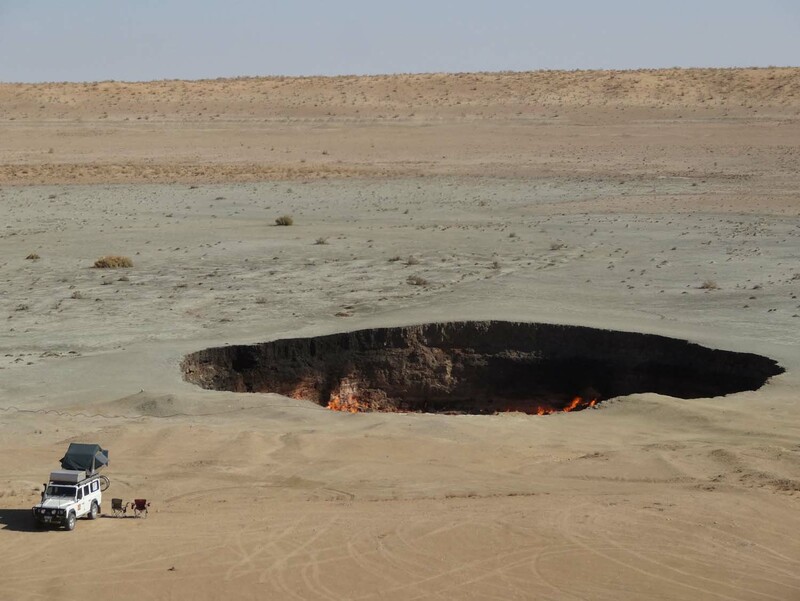 That’s why we left Konye-Urgench late in the afternoon to drive around 250km to Darvaza, where we were going to the natural gas crater that has been burning since 1971 in the middle of the Karakum Desert. 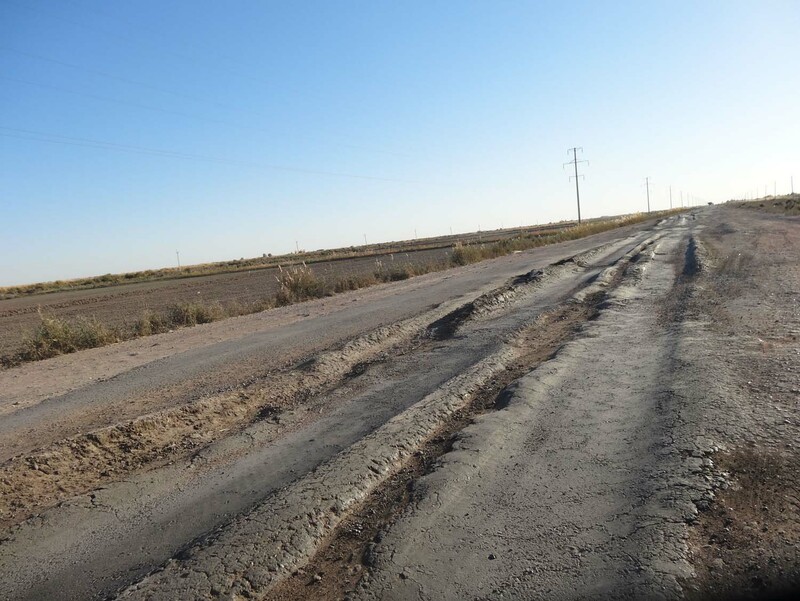 We had heard the first 80km of the road would be bumpy and after that it should be nice and smooth on a new road. Nearly 6 hours later we finally turned off the main road into a well-defined, easy sandy track to the crater. On the way down we were guessing from how far you’d be able to see the glow of the crater, but our guesses were miles off! Only about 2km away could we see the glow. We parked Lara and walked down towards the 50m-diameter crater. It was quite surreal with flames everywhere. The gas oozes out and, once set alight many years ago, has been burning ever since. We got our chairs out, opened our last bottle of wine from the rack (no alcohol allowed into Iran so we have to finish it all) and sat down to enjoy the biggest campfire ever. As it was very late that night before we went to bed, we slept in and had a leisurely morning at the crater. 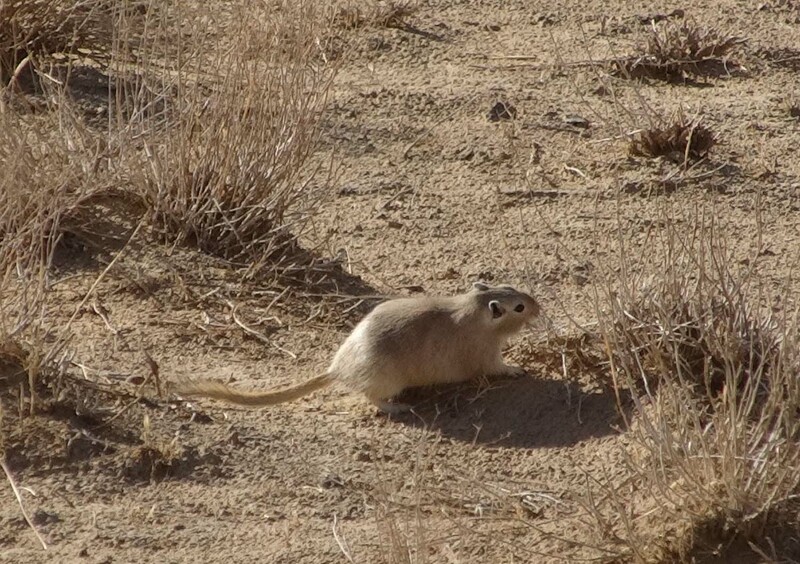 Not as impressive as in the dark, we focused on watching the ground squirrels run around and the stately dromedary cruise past instead. After lunch we drove further south towards Ashgabat, but spent another night in the beautiful desert just north of the city. Now we only had 3 more days left and we have to be out of the country on the 3rd day, so really we only had 2.5 days left. 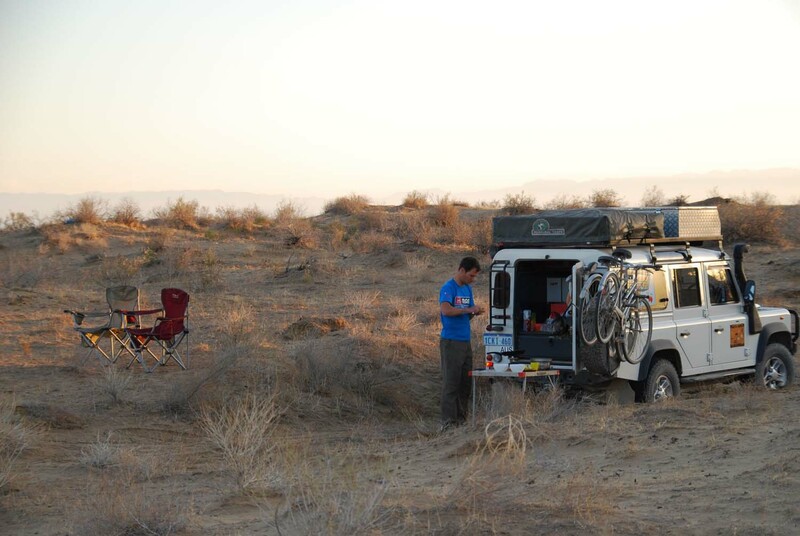 The pressure was on, so we got an early start, and drove straight to Kow Ata, west of Ashgabat. We drove past a wedding parade at some point and to our surprise they pulled in at Kow Ata after we had finished our lunch there. We watched in awe as the very traditionally dressed bride stepped out of the car, music was played by 3 men (drum, flute and accordion) and people started dancing and taking photos. Traditionally she will wear this dress for 40 days after moving in with her family in law before returning to her family for another 40 days. In this time the groom’s family has the time to cough up the remaining money for the dowry. Nowadays she only returns home for a few days before going back to her husband again. Half an hour later they all got back in their cars again and drove off, to the next photo shoot opportunity perhaps? 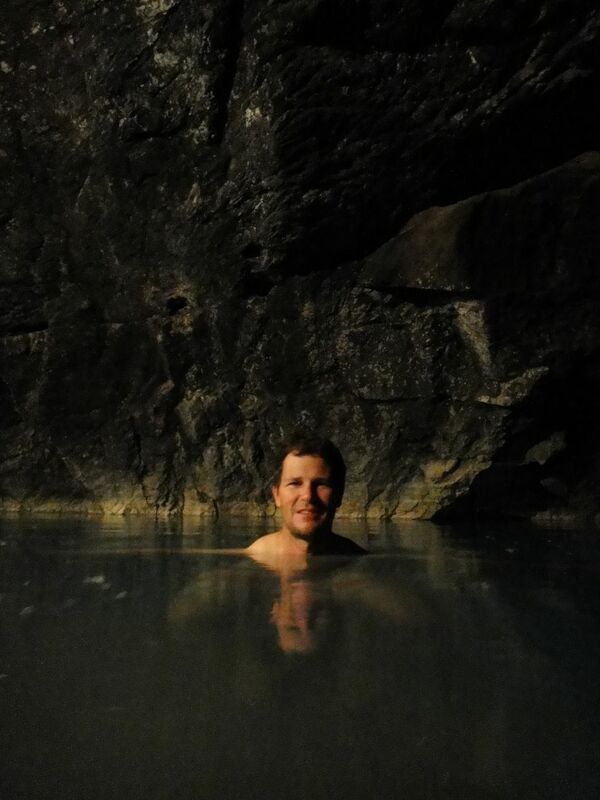 We got our bathers out and headed for the cave. Another unusual site in Turkmenistan, this cave has an underground lake that is naturally heated to 36 degrees and they have kindly made some changing rooms so you can go for a swim. The path leading you down looks nice, but with all the bats and pigeons living in the cave too, the water in the lake looked a bit like a bathtub after it has been used… We jumped in anyway, determined not to let that small detail spoil the fun of swimming in warm water 65m underground. 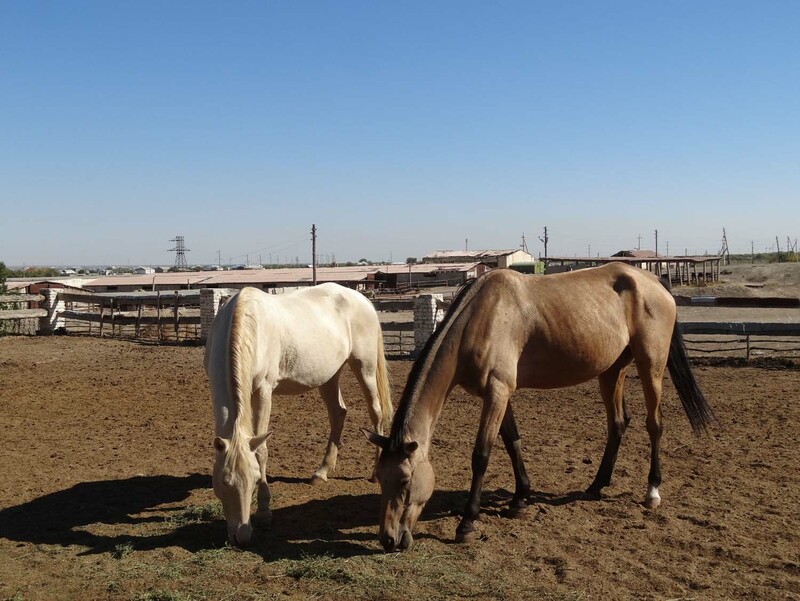 Our next stop was Alaja, a small farm where they have around 25 Akhal-Teke horses, considered to be the forefathers of our thoroughbreds with beautiful long necks and great for endurance. 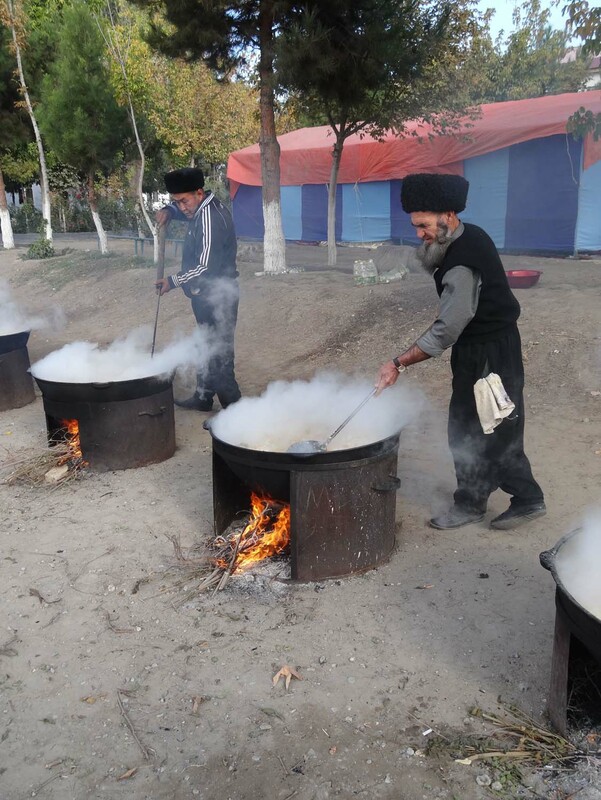 On our way there, we spotted a big group of men stirring about two dozen massive cooking pots and Jon went to investigate. It was a Friday and he was told people were doing their prayers and then would come to eat. They were making enough food for hundreds of people and of course we were invited to join in. 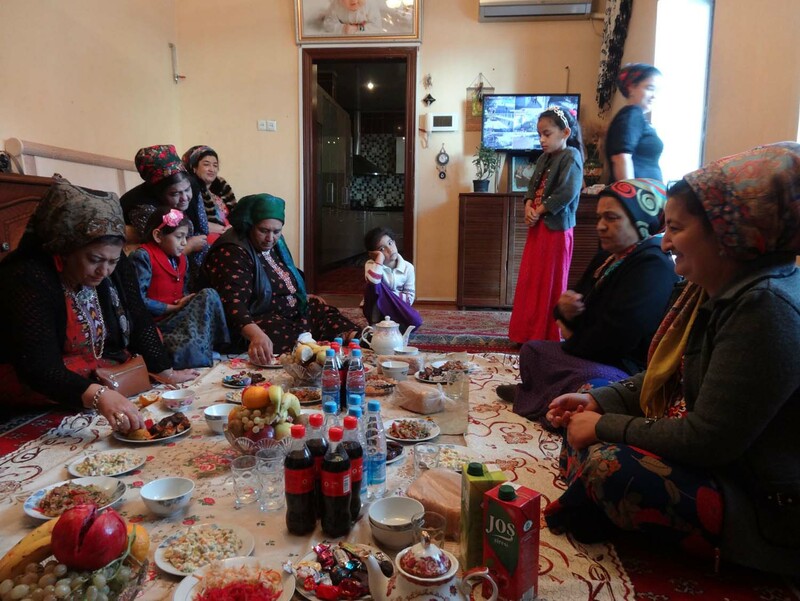 Inside the huge home we were sat down with the ladies around a plastic table cloth on the floor that served as our table. Dish after dish was added, caviar came out, drinks, salads, interesting looking cabbage and eggplant roles (that proved delicious), tea, sweets, fruit, bread, home-made jam, yoghurt, nuts, different cakes, and that was only the starters! Jude was in heaven as all dishes were fine for vegetarians and Jon was loving it too with so much food to eat plus he was given the best plov he had tasted in all of central Asia and a lovely stewed soup. Jude was given traditional socks to wear (and keep) and Jon a whole bag of plov for on the road. What had we done to deserve this amazing hospitality? Nothing, well we had shown interest in what they were doing and they really appreciated that. We wished our Russian had been better as conversation was very limited, but they did enjoy seeing the photos we had printed of our families. With our tummies full we said our goodbyes and drove to the farm. The owner was very busy, but in the end we were able to get out for an hour ride on the famous Akhal-Teke horses. An old man took us out and he turned out to be a champion horse racer from the Soviet era. He definitely knew what he was doing. 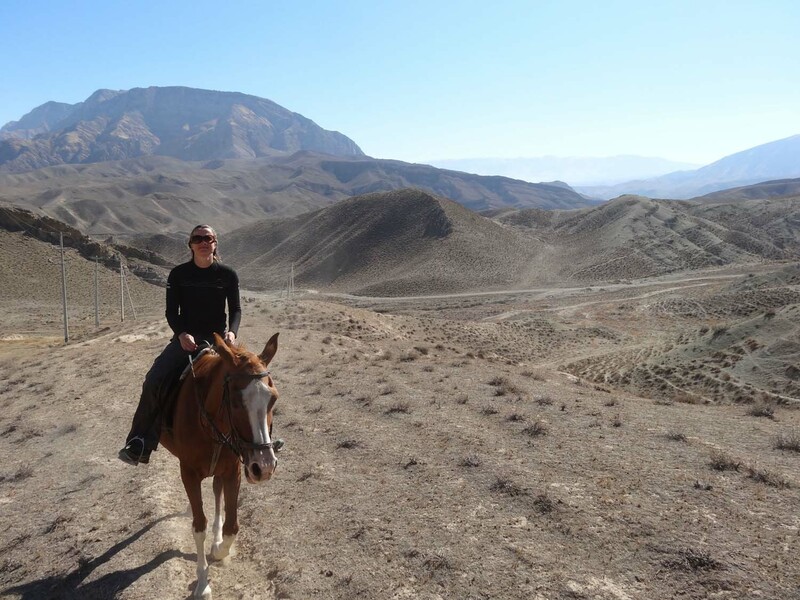 Our playground was the foothills of Kopet Dag mountains which forms the border with Iran We walked through the beautiful canyons, trotted or galloped up the hills and took it easy on the way down. Before we knew it our hour was up, our bums weren’t even hurting yet! 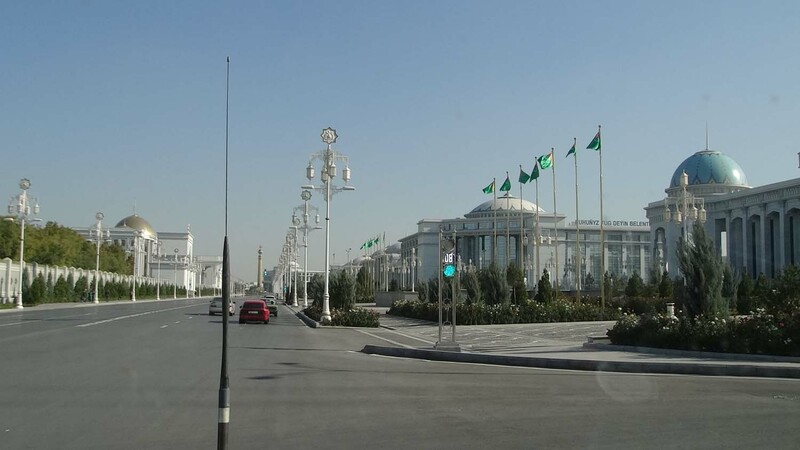 It was time to explore Ashgabat, which was unrecognisable from when Jon had visited 15 years ago. The whole city had been transformed with wide boulevards lined with endless white marble and glass apartment towers, government buildings and palaces. It all looked very shiny and impressive with lots of green parks, wide roads, open spaces and hardly any advertising (very refreshing!). A lot better than the old, cheap, crappy soviet buildings that were hastily built up after a massive earthquake in 1948 flattened the whole city. We understand people who are moved out of their homes are given new apartments in these towers where they only have to pay the difference in floor space at a 1% interest rate, starting after 5 years. It’s hard to know what to make of it. It can’t be a pleasant experience being told to move out of what might have been your family home for decades, but a new apartment instead of an old crumbling Soviet one doesn’t sound like a too bad a deal. It is a bit clinical though and we heard people preferred the old bazaar which was smaller, more chaotic, but it had character and even though it was very busy (the name Tolkuchka means pushing), everything was close together. The new market definitely lacks the character and is even further away from town. We wouldn’t have seen half of the interesting things if it hadn’t been for a man who appeared as our translator at some point and showed us around. trousers anyone? you can certainly say this is a one-size fits all! 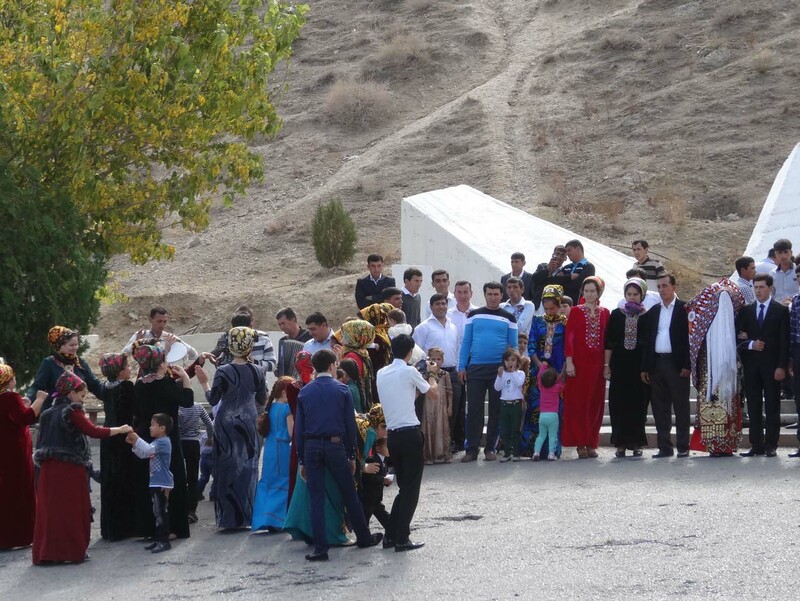 It was on our second last day in Central Asia that we finally had a run-in with the police. Watching at the parade rehearsals (it is their independence day in a few days) we took some photos which at first the police didn’t seem to mind. But, as we were leaving we were pulled up and asked to delete them. At first we played dumb, we of course wanted to keep our photos, but eventually he demanded to see ‘no images’ on the screen. 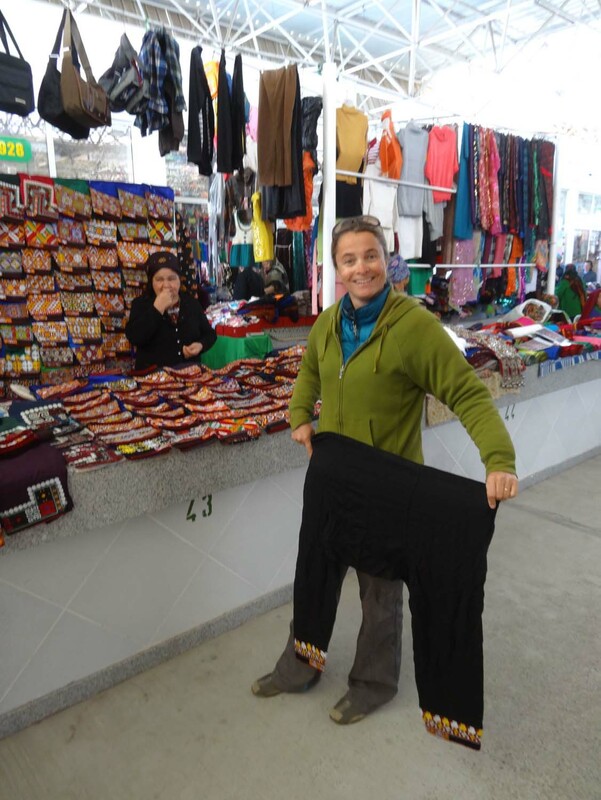 On our last morning in Turkmenistan we met up with Shohrat. Gabriel, who we had met in Arslandbob (Kyrgyzstan), had put us in touch. Again it proved invaluable to meet up with somebody local, especially as he was a great guy. He was bombarded with a million and one questions, but managed them well. We learned so much from him. He showed us around the Russian market and treated us to a lunch in a small restaurant with great food, even for Jude. He even had a wonderful gift for us, people he had never met, only exchanged a few emails with! We felt, again, very humbled and sad to leave a new friend. We only had a few hours left before our visa expired and had to make sure we crossed the border before it closed. Looks like you could sneak one picture past the police! love the crater, must be amazing at night. We might have been able to save some 🙂 and yes, the crater was amazing! From the satellite images that lloks like a pretty inhospitable desert you drove across. Amazing how you always seem to be able to get invited to meals and festivities wherever you go. Did you try to ‘recover’ any of the photos you had to delete on your SD card? Good luck in Iran – take care ! 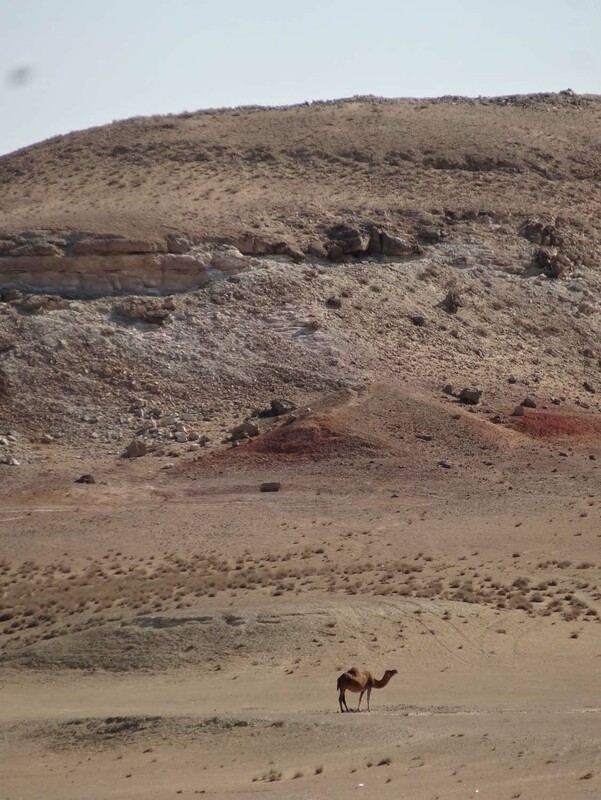 it was a beautiful desert, but yes very desolate! Jon has a talent to always find food everywhere… have you not noticed he doesn’t stop eating, ever? you’re giving it more live than it has had for years! glad it is still going!! how was the move to Brisvegas? Found a good spot? All unpacked yet?